Pound and tap some music! 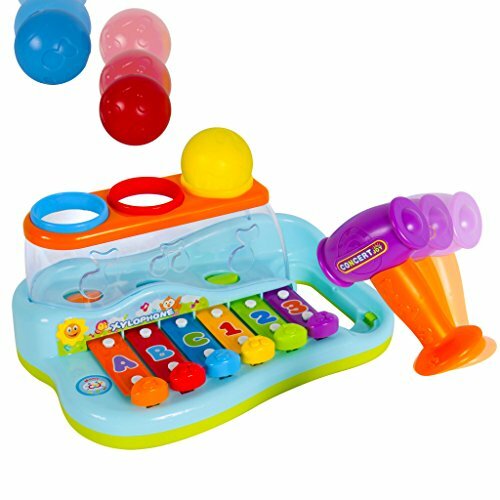 This colorful xylophone piano pounding bench is fun to pound! Place the 3 balls on top of the pounding bench. Use the hammer to pound and tap the balls. Once a ball drops, it will strike one one of the xylophone keys. There are 6 xylophone keys on this piano. Tap or slide across 6 xylophone keys to create pleasant scale of notes. The pounding bench measures 10" x 7" x 5". Includes hammer and 3 color balls. Your kids will love pounding the balls and striking the piano keys!